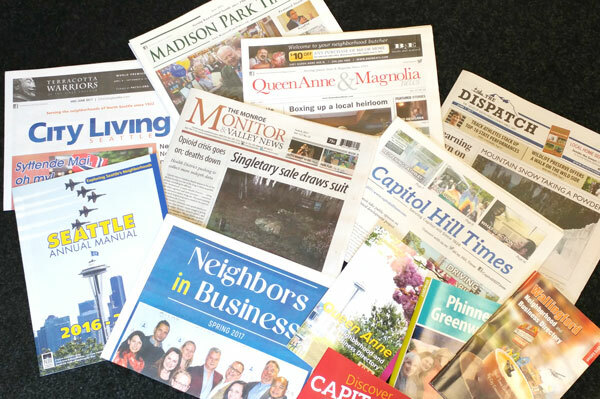 Pacific Publishing Company’s community newspapers serve Seattle’s most affluent neighborhoods with quality, award-winning journalism. In a multi-media universe, our newspapers provide coverage specific to our neighborhoods and our reader’s interest they can’t find anywhere else. Pacific Publishing distributes its papers through home delivery, direct mail, newsstand sales and strategic drops, allowing advertisers the flexibility to focus their marketing dollars on one, or more, of our neighborhoods with targeted market penetration. Week circulation into two of Seattle’s most established neighborhoods. Mostly direct-mailed the first week of the month to Seattle’s “Gold Coast” on Lake Washington. A mid-monthly magazine placed in affluent North Seattle households.